I had owned a small, punt-style bream boat for a few years, when decided I wanted something larger and with higher freeboard so my partner would feel safer coming fishing with me. I wanted a boat that would allow me to continue lure fishing in estuaries, bays (like Port Phillip and Western Port) and lakes, but also let me fish offshore for tuna, kingfish and marlin. I also needed to be confident that if the weather changed I’d get home safely. After considering what felt like just about every boat on the market, I went in to see Matt at Bar Crusher’s Victorian dealership and he took me for a test drive in a 615WR. I was sold. As a standard package, the boat is set up to fish. I added just a few extras like trim tabs, deck wash and a lean seat with backrest. I’ll add more toys as I get to know the boat, which is as easy as taking it back to the dealership to have any additional items fitted. Through the whole process I felt like all that mattered was getting my dream boat; no matter what engine, marine electronics or options I wanted included. Matt even brought a demo boat to my house to make sure it would fit in the garage! On our first trip to Portland we caught some southern bluefin tuna. We fished in 15-20kt of wind on one day, and with some thoughtful driving while trolling lures we stayed comfortable and relatively dry considering the short sea. 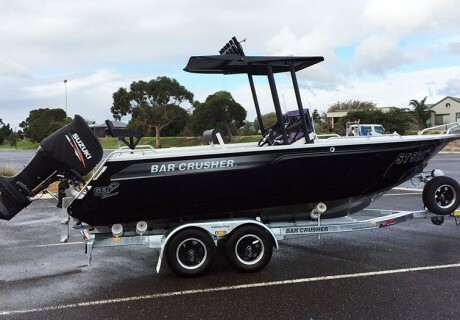 Although I haven’t had the boat for very long, my Bar Crusher has far exceeded my expectations. It is predictable even if you make a mistake, and it has really impressed me in every sea condition we’ve been out in. As with any boat, there is always a trade-off: this model is an open boat and we occasionally get some spray at certain angles, but I wouldn’t classify it as a wet boat; and I’m not racing off to buy a set of clears just yet. For me the 615WR been great so far. We have caught everything from bream to tuna in the short time we’ve owned it. I’m looking forward to chasing marlin this summer and can’t see myself wanting to change from this boat until I step into something bigger, like a HT model. Just need to convince my partner!